You’re reading How To Absolutely KILL Your Smartphone Addiction, originally posted on Pick the Brain | Motivation and Self Improvement. If you’re enjoying this, please visit our site for more inspirational articles. “One last video before I go to bed”. If you’ve ever had a “five minute Instagram break” turn into a two-hour procrastination session, you’re not alone. According to a study released by Deloitte, people between the ages of 18 and 24 check their phones an average of 74 times per day. The cell phone addiction is real, and it has been lowering our attention spans, making us more lonely, and increasing our chances of depression for as long as any of us can remember. There’s just something oh-so-irresistible about that “ding!” your phone makes when someone likes your Instagram photo. It almost makes the four and a half hours you wasted putting filters on your picture seem worth it. But is it really worth it? Our phones have replaced our calendars, our clocks, our calculators, and now, our lives. 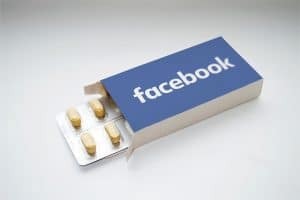 It seems hopeless to even attempt to break free from the drug that is your smartphone. But it can be done. Here are three killer ways that you can use technology to kill your smartphone addiction. 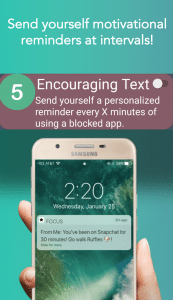 “Encouraging Text” allows you to send yourself personalized motivational reminders at different intervals of using a blocked app. 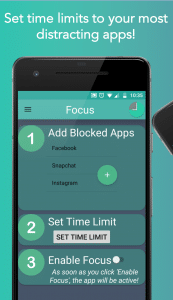 It’s just another way to get rid of your app addiction! 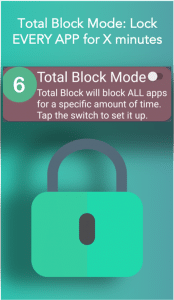 “Total Block Mode” lets you completely block every app on your phone for a specific amount of time. It’s great for if you ever really need to focus for just the next X hours. Create a usage journal. 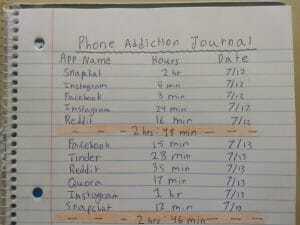 Just the mere act of writing down your app usage will help kill your phone addiction. The picture above is how I organize my phone addiction journal—with three simple columns. Column one is the app that I’ve opened, column two is the amount of time I’ve spent on it, and column three is the date. Set reasonable goals for your daily usage, and decrease your time each time you set a goal. You might be able to do this faster digitally on your phone’s notepad app, but I prefer a real journal since the purpose of this activity is to start using your phone less! As the weeks go by, compare your daily usage, and I guarantee you will have made progress! At first, it felt as if I had deleted a part of my soul; I had nothing to do when I was waiting for the bus or in the bathroom—I was left with my own thoughts and nothing else. It felt empty. But after a week or so, I had freed up two-three hours each day to spend meditating, exercising, and working on new projects. Your smartphone isn’t inherently bad. In fact, it’s a great tool to make plans with friends and family, maintain valuable connections, and even be productive. However, a smartphone addiction is inherently bad. It’s time that you beat this addiction once and for all. Don’t let opportunities walk past you as you stay at home, glued to your phone. Put the phone down, look up, and live. 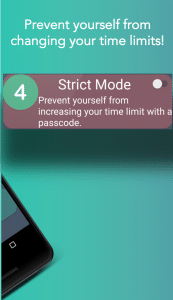 You’ve read How To Absolutely KILL Your Smartphone Addiction, originally posted on Pick the Brain | Motivation and Self Improvement. If you’ve enjoyed this, please visit our site for more inspirational articles.